At the end of the River Bure Great Yarmouth with its miles of golden sandy beach is Norfolk’s premier sea-side resort. 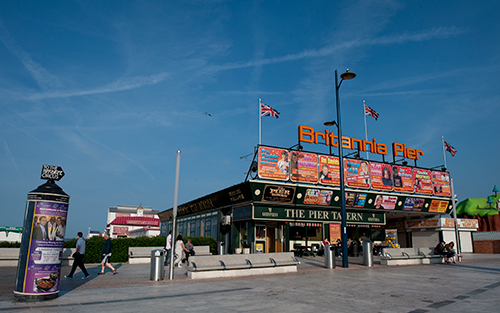 Enjoy the traditional seaside amusements at Britannia or Wellington Pier, take a donkey ride along the beach or take a boat trip to see the Seals at Scroby Sands – boats leave from the shore between the two piers. Deckchairs are available to hire on the beach and buckets and spades are sold in abundance. Marine Parade (or the Golden Mile) is the heart of Great Yarmouth’s seafront. Visit the Pleasure Beach with its thrilling rides, enjoy a round of adventure golf at Pirates Cove or Castaway Island or discover the amazing miniature world of Merrivale Model Village with its award winning landscaped gardens.Children can enjoy the rides at Joyland fun park, find Nimo & Dory at the SeaLife Centre, get their skates on at RetroSkate or tackle the inflatable obstacle course at Marina Leisure Centre’s tropical pool.Away from the beach you can learn about Great Yarmouth’s fascinating history at the Time and Tide Museum or enjoy one of the amazing performances at the Hippodrome Circus.For shopping Great Yarmouth boasts a covered market 6 days a week, which sells a wide range of fresh produce, takeaway food, clothes and household goods. As well as an open air market, on Wednesdays & Saturdays, which stocks everything from jewellery to DIY tools. Alternatively browse the shops on Regents Rd or head to Market Gates shopping centre.Regular trains to & from Norwich depart from Great Yarmouth railway station. Great Yarmouth has a good range of pubs, bars, restaurants, and cafés located around Marine Parade, Regents Rd and King St.